April 18, 2017, New Delhi:The availability of cash dispensing ATMs across the country continues to worsen. More than 5 months after the Government announced the demonetisation move, citizens would have expected the cash crunch and dry-ATM situation to end. Unfortunately, it is not the case in some parts of India. Although the cash availability in banks has improved, the availability of cash at ATMs has actually worsened in the last month in many parts of the country. 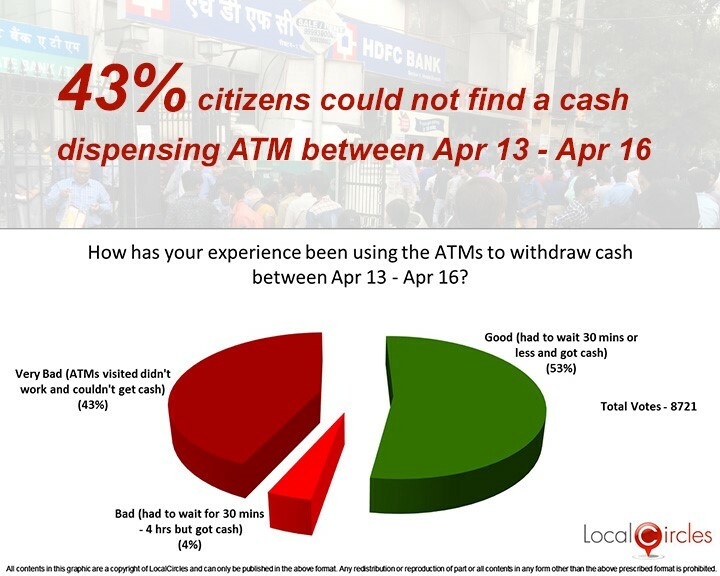 In a survey conducted by citizen engagement platform LocalCircles, 43% citizens said that they could not find cash in ATMs between April 13 and April 16. This number has worsened from the 36% who had faced problems in finding a cash dispensing ATM between April 5 and April 8. Over 8,700 citizens from across India participated in this poll sharing ATM experiences in their areas. RBI’s move to lift withdrawal limits on March 13 could be attributed to the happenings. People have been withdrawing cash in bulk from the counters and the banks have been forced to maintain high liquidity. This has resulted in the maintenance of ATMs taking a back seat and them not getting replenished with cash frequently. People have also been with drawing large amounts from the ATMs due to some banks levying a transaction fee after 4 withdrawals from ATMs, leading to the ATM going out of cash quite quickly. 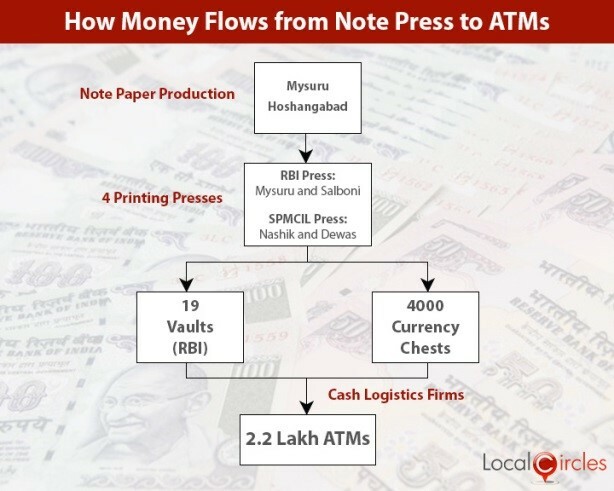 Some field checks with bank officials also indicated slower supply of cash from the printing press to the currency chests and from the currency chests to the banks. 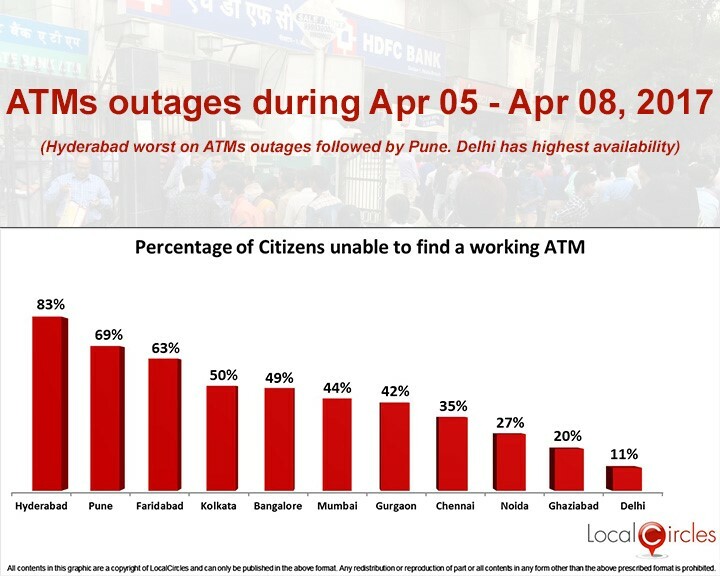 LocalCircles also conducted a citizen pulse check in 11 cities across India to find out that Hyderabad was worst hit with ATM outages followed by Pune. 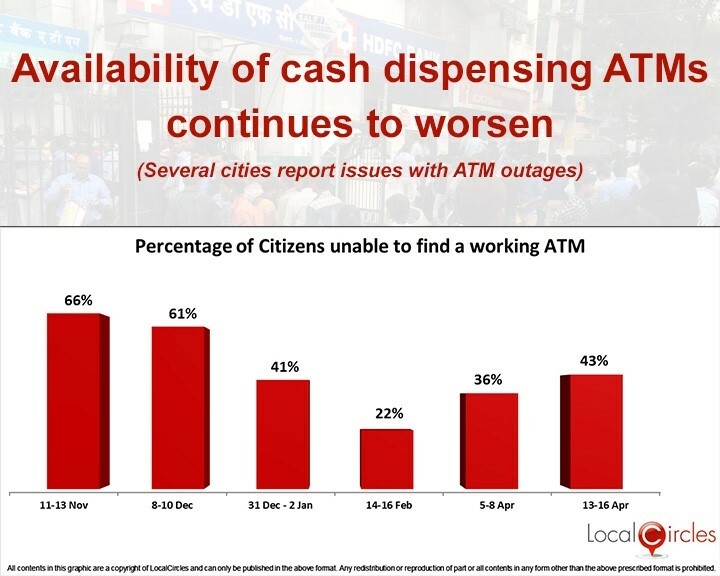 83% citizens in Hyderabad and 69% citizens in Pune said that they were unable to find cash dispensing ATMs between April 5 – April 8. Delhi recorded the highest availability of cash dispensing ATMs with only 11% citizens unable to find money in the ATMs during the mentioned days.